Students will create their own performances by exploring a range of imagined and created situations. They will learn to use a variety of different techniques including mime and improvisation while developing their vocal and physical expressive skills to create original performances and stage scripted dramas. They will explore different dramatic forms and styles from Mask and Shakespeare to Realism as well as modern theatre movements. In addition, Drama is a subject which provides an opportunity for students to develop self-confidence and creativity. It is a subject that relies on group work and thus helps develop better skills in communication and co-operation. Drama is also offered in Years 11 and 12 providing an opportunity for students to further their studies with a more in depth approach to theatre and drama. 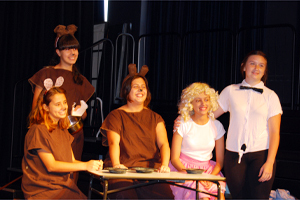 The content and experimental work studied throughout Stage 6 provides ways for students to engage with and understand the relevance and importance of Drama in an historical, cultural and social context enabling them to approach their HSC performances with a much broader understanding of the craft.